Director of the Russian Musical Society. 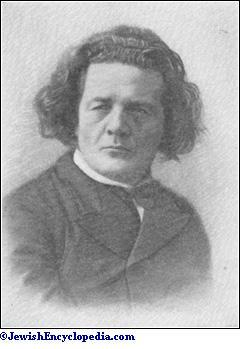 Russian pianist and composer; born Nov. 16 (28), 1829, in the village of Wechwotynetz (Vikhvatinetz), near Jassy, Bessarabia; died at Peterhof, near St. Petersburg, Nov. 20, 1894; brother of Nikolai (Nicholas) Rubinstein. His parents were Jews who embraced the Greek-Orthodox religion, probably a few years after Anton's birth; the entire family removed to Moscow in 1834, where his father established a pencil-factory. Anton, the fourth of six children, received a good education from his mother (Katherina Khristoforovna, née Löwenstein), and from her he also took his first piano-lessons. At the age of seven he commenced to study under A. I. Villoing, the leading piano-teacher in Moscow. The latter taught him gratuitously from his eighth to his thirteenth year. In his reminiscences Rubinstein refers gratefully to Villoing. In 1839 Rubinstein gave his first public concert, in the Petrovski Park at Moscow, and in 1841 he gave, under Villoing's personal direction, a series of concerts in Germany, Holland, Scandinavia, and France. While in Paris he visited Chopin, who left a deep impression on Rubinstein. Somewhat later he met Liszt, then the musical idol of Europe. The latter was so carried away by the boy's playing that he took him in his arms and declared that he would make him his heir in art. Rubinstein visited London also (1842), where he won the admiration of Moscheles, and met Mendelssohn at a private concert given before Queen Victoria. On his return to Russia in 1843 Rubinstein was invited to the Winter Palace, where he was presented to the imperial family. Emperor Nicholas I. treated him kindly, and, embracing him, jokingly addressed him as "your Excellency." Rubinstein's public concerts in the Russian capital met with signal success; and the income from them went to meet the needs of his parents, who were then in pecuniary difficulties. In 1844 he accompanied his mother and his brother Nikolai to Berlin, where, on the advice of Mendelssohn and Meyerbeer, he studied composition under Dehn, and also studied under Marks. His mother was compelled in 1846 to return to Moscow, his father having died and left his business affairs in a confused state. In order to preserve her husband's good name Katherina Khristoforovna paid all his debts. She was thus left Penniless and was compelled to become a music-teacher in a private school in Moscow. She died in Odessa in 1891. 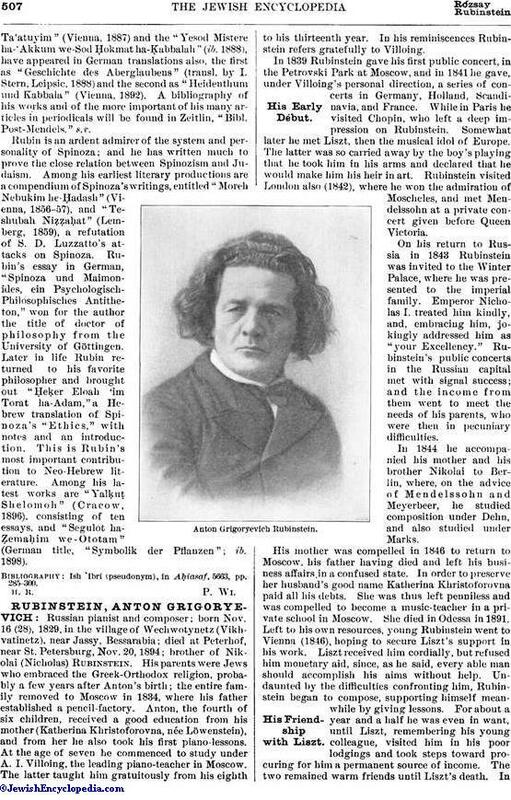 Left to his own resources, young Rubinstein went to Vienna (1846), hoping to secure Liszt's support in his work. Liszt received him cordially, but refused him monetary aid, since, as he said, every able man should accomplish his aims without help. Undaunted by the difficulties confronting him, Rubinstein began to compose, supporting himself meanwhile by giving lessons. For about a year and a half he was even in want, until Liszt, remembering his young colleague, visited him in his poor lodgings and took steps toward procuring for him a permanent source of income. The two remained warm friends until Liszt's death. In1847 Rubinstein went back to Berlin, and at the outbreak of the Revolution of 1848 he returned, on Dehn's advice, to St. Petersburg. At St. Petersburg, Rubinstein received the patronage of the grand duchess Helena Pavlovna, and his musical reputation was thereby established. His opera "Dmitri Donskoi" appeared on the imperial stage in 1852, and his "Sibirskije Ochotnikie" in 1853. In 1854 Rubinstein made another concert-tour through Europe; in 1858 he was appointed court pianist; and in 1859 he was made director of the Imperial Russian Musical Society, which he had been instrumental in founding. The conservatories of St. Petersburg and Moscow had their origin in this society; and under the instruction of Anton and Nikolai Rubinstein there graduated many talented musicians, among them Tchaikowsky and Madame Essipic. The great services rendered by Rubinstein in the advancement of music in Russia were recognized by the czar, who decorated him with the Vladimir Order. In 1865 Rubinstein married Vera de Tschikouanov, a maid of honor at the Russian court, who bore him three children. He toured Europe in 1867-70; and in 1876 he resigned the directorship of the Conservatorium. 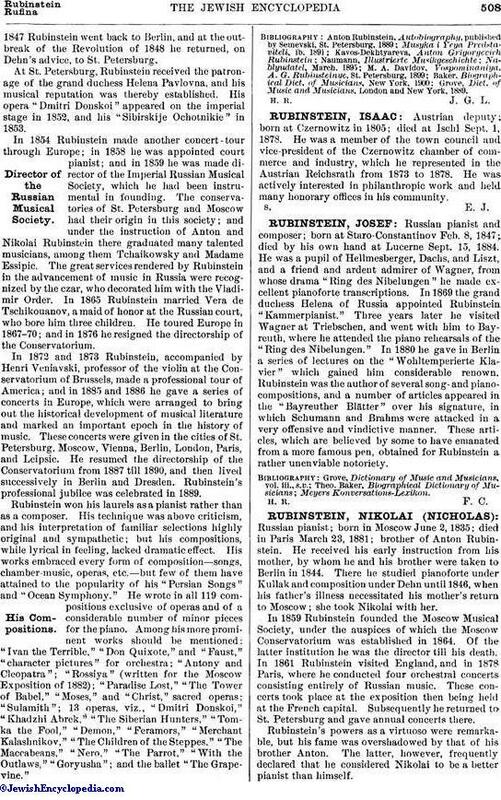 In 1872 and 1873 Rubinstein, accompanied by Henri Veniavski, professor of the violin at the Conservatorium of Brussels, made a professional tour of America; and in 1885 and 1886 he gave a series of concerts in Europe, which were arranged to bring out the historical development of musical literature and marked an important epoch in the history of music. These concerts were given in the cities of St. Petersburg, Moscow, Vienna, Berlin, London, Paris, and Leipsic. He resumed the directorship of the Conservatorium from 1887 till 1890, and then lived successively in Berlin and Dresden. Rubinstein's professional jubilee was celebrated in 1889. Rubinstein won his laurels as a pianist rather than as a composer. His technique was above criticism, and his interpretation of familiar selections highly original and sympathetic; but his compositions, while lyrical in feeling, lacked dramatic effect. His works embraced every form of composition—songs, chamber-music, operas, etc.—but few of them have attained to the popularity of his "Persian Songs" and "Ocean Symphony." He wrote in all 119 compositions exclusive of operas and of a considerable number of minor pieces for the piano. Among his more prominent works should be mentioned: "Ivan the Terrible," "Don Quixote," and "Faust," "character pictures" for orchestra; "Antony and Cleopatra"; "Rossiya" (written for the Moscow Exposition of 1882); "Paradise Lost," "The Tower of Babel," "Moses," and "Christ," sacred operas; "Sulamith"; 13 operas, viz., "Dmitri Donskoi," "Khadzhi Abrek," "The Siberian Hunters," "Tomka the Fool," "Demon," "Feramors," "Merchant Kalashnikov," "The Children of the Steppes," "The Maccabeans," "Nero," "The Parrot," "With the Outlaws," "Goryusha"; and the ballet "The Grape-vine." Grove, Dict. of Music and Musicians, London and New York, 1889.